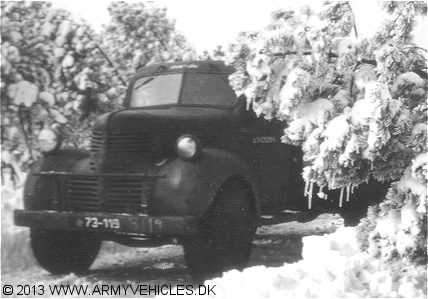 Danish Army Specific: 44 received from the British Army in Germany in the summer of 1945 and all were still in the inventory in 1952. Historical: The T110L-5, D60L as it's full designation sounded was produced by the Dodge Chrysler Corp. of Canada from mid 1941 to a British order. Known as "modified conventional pattern" (MCP) type, i.e. a commercial type adapted to military needs, it was one of a wide range of Modified Commercial Pattern vehicles used by all Commonwealth countries. Other makers were Ford and Chevrolet. Some 3.000 vehicles were produced. A dual rear tire version was known as the T110-4, D60LD. Length: 6.55 m (258 inches). Width: 2.28 m (90 inches). Height: 3.15 m (124 inches). Weight: 3.540 kg (7.865 lb.). Engine: Own 6-cylinder, 3.878 cm3 (236 cubic inches) displacement, liquid cooled, carburettor. Horsepower: 95 at 3.600 rpm. Additional: Steel or composite body. Eaton 2-speed rear axle.